In A Responsible End? 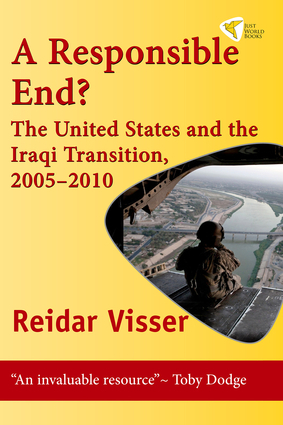 the highly regarded expert on Iraq Reidar Visser tells the story of both the internal politics of Iraq and the United States' role and involvement in it. Many Americans had hoped that the 2005 elections would usher in an era of democracy in Iraq. But the aftermath of the elections was devastating for many Iraqis, as sectarian violence engulfed Baghdad and other key areas of the country in 2006-2007.Visser provides a clear analysis of the complex path Iraq's internal politics took during those seminal years and charts how, very often, Washington's policies ended up seriously weakening the very country that President Geroge W. Bush claimed he had come to "save." Reidar Visser is a research fellow at the Norwegian Institute of International Affairs. He has a background in history and comparative politics and holds a doctorate in Middle Eastern studies from the University of Oxford. He has published extensively on the history of southern Iraq and issues of decentralization and federalism relating to Iraq.